Jewelry isn’t just limited to women and children, anymore than rings are limited to women only. 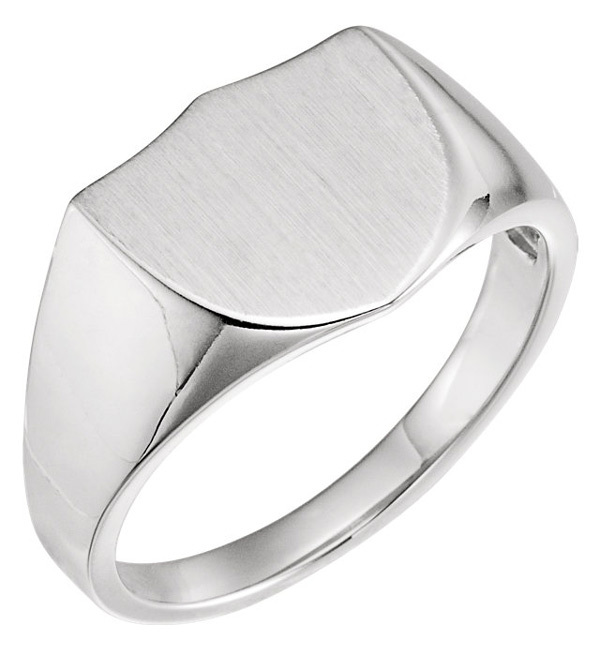 Aside from wedding bands, there are other stylist rings that men can wear that will suit any outfit, and any occasion. Let me show you 4 different ways that men can style rings and still look masculine. Personalized rings that are engraved are simple, yet personal ring designs that men can wear, and choose to have specific engravings on top, and also on the inside as well. For example, you can get this engraved shield signet in 14K Gold or White Gold (shown left), with the ability to choose a letter to be engraved on the face of the ring, and an engraving on the inside of the ring (up to 13 characters long). It is a unique gift that you can purchase for your male friend, or husband, or for your own self. Whether you want to add a specific memory on your ring, or your favorite sports team player number and name; perhaps even a shortened abbreviation of your favorite Bible verse. The options are endless! “This then is the message which we have heard of him, and declare unto you, that God is light, and in him is no darkness at all” (1 John 1:5). Similar to this is the solid 14K White Gold engraved signet ring that allows you to have up to three characters on the face of the ring. If you want something more unique, both rings have the option to have a monogram style engraved on the ring. See also our men’s 14k white gold engravable signet ring with a more rectangular design that can be quite masculine, yet still stylish. Custom Black Stainless Steel Spinner Ring for Men with NamesSpinner rings are also always in style. This custom black stainless steel spinner ring for men lets you engrave any kind of message you like on both the interior and exterior of the ring. 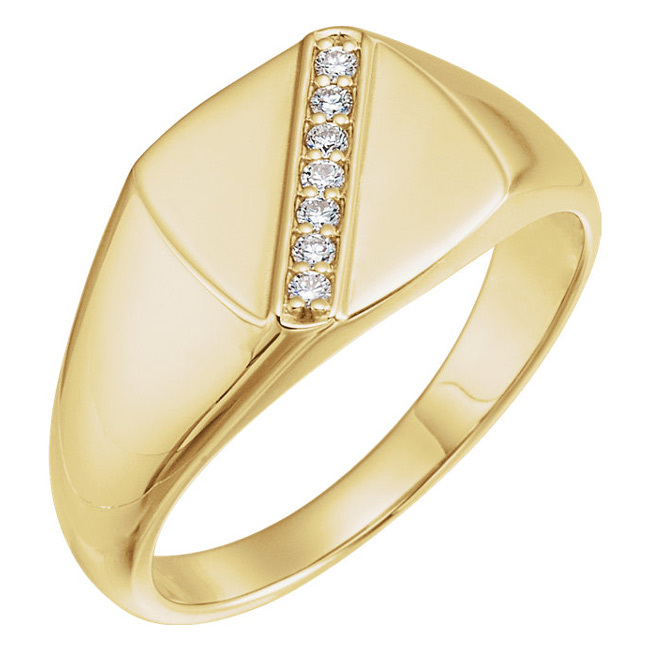 It is perfect for any style and occassion, with the ring giving you that sleek look! “There is gold, and a multitude of rubies: but the lips of knowledge [are] a precious jewel” (Proverbs 20:15). Don’t tell me that men don’t like a little bling in their lives! Diamonds can be a man’s best friend too. Check out these stunning black and white diamond rings from Apples of Gold Jewelry. If you know a guy, or you personally enjoy having a bit of style in your life, then add to it these amazing diamond rings. Keep it real, and keep it simple: 1/3 carat black and white diamond ring in 14K White Gold. Prefer less diamonds or a ring in Gold instead? Then this is for you, my friend! 0.10 carats of white diamonds in 14K Yellow Gold (shown right). Wear your faith by having the reminder of Jesus’ sacrifice on the cross on you, with this 14K Gold crucifix ring for men, from Apples of Gold Jewelry. A simple design for all men to wear with any outfit, on any occassion, that illustrates the most powerful message and historical event of all time: Jesus, the sacrificial lamb, the Messiah, Christ our God. “But he [was] wounded for our transgressions, [he was] bruised for our iniquities: the chastisement of our peace [was] upon him; and with his stripes we are healed” (Isaiah 53:5). There are also other Christian Rings for Men that include the cross such as this celtic cross ring design. The way in which the cross has been designed gives the ring a more stunning and unique appearance, with a 14K yellow gold finish. “And he is the propitiation for our sins: and not for ours only, but also for [the sins of] the whole world” (1 John 2:2). 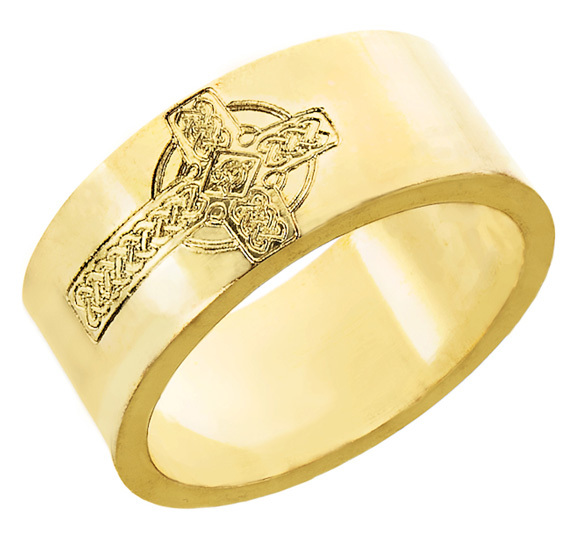 See our Men’s 14K Gold Celtic Cross Ring for a very masculine Celtic ring for men. Tone it down by wearing this two-tone Christian Cross ring that has a 14K white gold cross design in the middle (shown left), and the ring band made of 14K yellow gold. “Neither by the blood of goats and calves, but by his own blood he entered in once into the holy place, having obtained eternal redemption [for us]” (Hebrews 9:12). 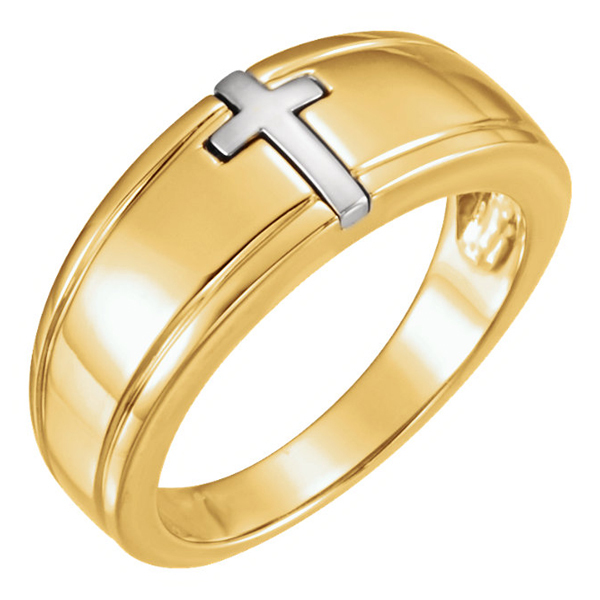 For more designs, see our Cross Rings for Men, from Apples of Gold Jewelry’s Christian rings and jewelry collection. There are also men’s wedding bands that have the celtic cross design on them as well, if you prefer to seal your vows, through the representation of your faith in Christ, rather than going for a plain silver or gold wedding band. “And ye know that he was manifested to take away our sins; and in him is no sin” (1 John 3:5), such as in our Etched Celtic Cross Wedding Band Ring for Men. Don’t forget that men can have diamonds in their wedding bands too (See our men’s diamond wedding bands category for a spectrum of unique and quality designs for men)! Just like I have mentioned above, diamonds can be a man’s best friend also. Say “I do” in style, and match your wife’s ring by adding a little diamond bling into your wedding band too! Whether you prefer the one, perfect, centered 0.25 carat diamond ring with a titanium band finish; (shown right). 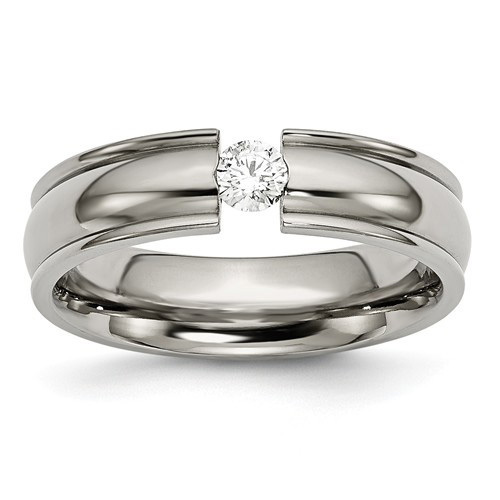 Or see our Three stone 1/5 carat white gold wedding band ring diamonds in the centre of a 14K White Gold wedding band; or several diamond stones spaced out in a 14K White Gold wedding band, that makes you look stylish and sophisticated, without going over the top. Even if you do not want diamonds, or other stones in your ring for that matter, Apples of Gold always has genuine wedding bands in several different sizes and design finishes such as this 6mm flat platinum wedding band, or this more traditional, domed 6mm platinum wedding band. 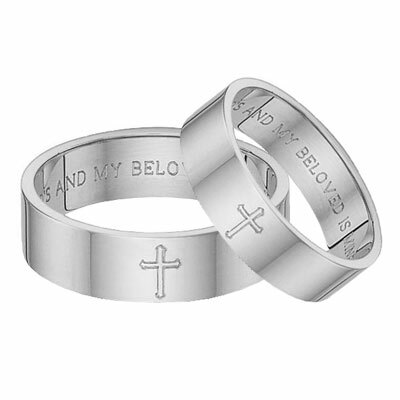 “Thy kingdom come” Lord’s Pray Wedding Band Ring from The Lord’s Prayer in Matthew 6:10; and the classic scripture from Genesis 5:2 emphasizing God’s creation of male and female. “Male and female created he them; and blessed them, and called their name Adam, in the day when they were created” (Genesis 5:2). See our Male and Female Created He Them Wedding Band Ring. There are so many other different styles and designs to choose from, at Apples of Gold Jewelry, that men can wear and truly pull off. With an average of 30% below retail price, and free shipping, take the opportunity to browse and shop there today! Men’s Wedding Bands: Masculine Beauty!